Happy Horse Band plays Jubalfest 2017 on Sept 30! Happy Horse Band's latest CD! Hollis, writing in collaboration with her friend and fellow artist Dean Cardwell, stepped off the bridle path that she previously explored at breakneck speed and into a new, bolder universe of adventure tales. The Gypsy Trilogy of romantic tunes, Wild Gypsy Women, Bangles of Gold, and Warrior Queen Waltz, dances through myth and legend, telling the tale of how the best musician usually gets the most adventurous girl, who then must test him! Gleefully inspired by Hollis' life as a visual artist producing and selling her artwork at Renaissance Faires, they're sure to enchant and make you dance and whirl! Hollis' earthy powerhouse voice - likened to a young Cher by some listeners -- weaves tales of young love and daunting escapades, personal impatience (Sweet Shortcut) and unacknowledged ineptitude (Daddy's on the Short End) as well as timeless quests for treasure and glory by fearless warrior queens who dare to do battle with snow demons and mountaintop wolf kings, aided by a princess's mighty champion and his secret weapon! Truly original music fuses different styles into an unexpected and uniquely bright sound of voices and a few instruments. The album title "Beneath the Flower Moon" is a line from Bangles of Gold, a song about a young hero finding his true love, is a fun and energetic listen. Catchy choruses and descriptive verse poetry will have you singing along to these stories in no time, as you cruise your world of highways and work time pursuits, providing every listener with a brief and pleasant respite from reality! Starship is pure escapism, to distant galaxies: "If only we could fly, as fast as light itself!" is an echo of our universal childhood wish for wings and the wind to take us on fantastical journeys. Moon Ponies sweet restraint hints that things may be other than they seem to earthly eyes, although the exhortation to "Take some time for Magic, and Love!" is an easy truth for all who care to hear. Hollis again invites you into her special world, as illustrated by verse and voices, poetry and percussion, guitar and harmonica, with a dash of kazoo! Start the music, close your eyes, turn it up! Enjoy the trip! The high energy arrangements and delicious harmonies of "Hell Bent For Leather" will have you cruising happily down the highway to the driving beat of Happy Horse Band's latest collection of slightly country, slightly rock 'n roll and totally thrilling tunes! Hollis Wayne's harmonica and earthy lead vocals blast right outta the chute on this concept album. The title track, "Hell Bent For Leather," is the fast and fiery shout of a desperate wild weather ride through a fierce and unexpected Texas spring storm. The frantic feel of imminent danger in a cowboy's nightmare dream will quicken your heart and make you check the horizon for trouble! The rich, complex and energetic sound of Happy Horse Band's latest work surround your mind like a swirling wind dervish, weaving musical pictures in the vibrant instrumental colors of screaming violins and harmonicas, throaty guitars, sensuous saxophones, pounding piano and tasty percussion, overlaid with the quartet's luscious vocal harmonies. They whip off, laughing, into another direction as the lyrical adventure stories grow and change. Hollis' new songs and DB Rouse's paen to life on the road via way of Missoula, Austin and Wisconsin, testify to the loving work and attention to detail that the Happy Horse Band (Hollis and DB Rouse, John Warner Dunn, Pete Langhans and a stellar assortment of returning and new guest artists: DrD, Niamh Fahy, Matt Kelly, Bobby Dabbs, Bob Landgraff, poured into two years of time creating "Hell Bent For Leather," the 3rd CD in the Happy Horse Trilogy. It's been a long, strange trip! The joy of the musicians is audible in this engaging music; there is a brightness and newness here that is rarely heard in a commercial world. The Happy Horse Band has traveled far from its campfire beginnings in 2006, riding ever further into a cosmic expression of the lyrics and melodies that gallop through the heart and mind of Hollis Wayne, a life-long street and Renaissance Faire artist who turned to songwriting and music as a path to move her art forward. She draws her creative energy from the mythical and dynamic relationship between horse and rider, and their interaction with the challenges inherent in living an outdoor life. The weather is always a great metaphor for what life unexpectedly throws down in our path, but in this case it's an actual true ridin'-out-on-the-trail survival story! Later, there is a rollick from the back porch of a family feast ("Texas Pie") to the excitement of "Go For Broke" and watching the horses run their hearts out "At the Track." Seasons pass and times change, and the fun and adventure give way to the plaintive solitary percussion that opens "Empty Kitchen Blues," a sonic narrative of a deserted life. Dreaming of a sweetheart and times gone by, "Romeo" takes the train to Montana and finds a life mission and family. "Female Kinda Mind" puts the blues back in the groove of trouble headed this way and "Graveyard of Memories", with its evocative Spanish guitar, confronts the dissolution of a relationship. The final track, "Pearly Gates," confronts the inevitable and ultimate boogeyman with a powerful cry of, "Ain't my time to be gone from here!" The original music, harmonies and orchestral instrumentation created by Hollis Wayne and the Happy Horse Band, guided again by producer, friend and mentor Darrell "Dr. D" Vernum and painstakingly tracked at Orb Recording Studio in Austin, Texas, creates a solid concept album from start to finish. It's a Wild Weather Ride through some sweet and stormy weather, and it'll take y'all right to the Pearly Gates! The ballads eddy into splashing pools of sound and the listener is invited to contemplate our mental, physical and spiritual journey through day to day adventures. This music MOVES, and it will move you. Turn it on, TURN IT UP, tune it in and let 'er rip! Original tunes that are a little rock, a bit of western, a dash of bluegrass and the most important ingredient, fun! Songs about taking the risk, reaping the reward, and living an adventurous life! Horses, bank robbery, fire, drought & deluge, camping and a classic old Texas cowboy's tale of working cattle on the night shift. Recorded in Austin, Texas at Parrot Tracks Studio & produced by Darrell "Dr. D" Vernum. "I often feel like a female Gene Autry with Keith Richards as my sidekick," laughs Hollis Wayne, lead singer for Happy Horse Band. The sidekick is guitar player and fellow lead singer-songwriter, DB Rouse. DB's catchy riffs and rhythms pull the listener right into the stories spun by these two adventurous bards on the band's second CD, Rockin' & Ridin'. "When we threw long-time fiddling friend Phoebe Hunt into the mix as guest artist on fiddle and vocals, the result morphed into some kind of wild ride with the Cowgirl Valkyries!" 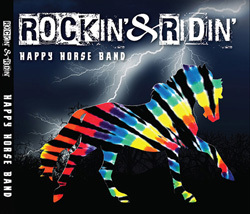 Happy Horse Band emerged from Austin's Parrot Tracks Studio in July 2013 with Rockin' & Ridin', a 10-track collection of tunes written by Hollis Wayne and DB Rouse, engineered by George Coyne & produced by Darrell "Dr. D" Vernum. The opening track, "Looking For A Pearl" asks the big question immediately: "Would you like to sing a song with me, maybe take a little trip?" and is a full-blown anthem about a rodeo rider searching for just the right kind of companionship. Then come the quick-witted gallops like "Breadcrumb Trail" and "Let's Go Dashing", the alt-country groove of "Rained Out On Friday", the forlorn folk sound of two male voices on "Night Herder", and the homespun group fun of "Camp Song". great advice! With the addition of Pete Langhans on drums (previously of The Mother Truckers), the pace and intensity of the band's music definitely ramped up a couple of notches from the laid-back sounds of their first CD in 2010, RIDE RIDE RIDE! Hollis's earthy, mellow alto voice is joined by the intricate harmonies of DB Rouse, John Dunn and Bob Landgraff, with guest artist Phoebe Hunt's fine soprano layered into many tunes. Phoebe's lead vocals soar on "Baby Divine" and her awesome fiddle playing and vocal harmonies are sprinkled generously throughout the disc. Dominick Leslie of The Deadly Gentleman throws down hot bluegrass mandolin licks on "Scout, the Mighty Paint Horse," DB's new John Henry of Horse Songs, meant to make a legend of Hollis's trusty, energetic steed. (watch the music video on Youtube!) George Coyne's searing lap steel on "Mischief On My Mind" will make you want to rob a bank (just be mindful of the repercussions when the sheriff arrives!). "Won't Rain On Texas" is an epic piece inspired by Texas's disastrous 2011 Bastrop County Complex Fire and the ongoing drought, which all of the band members actually lived through and survived. Other guest artists featured on the CD are: Beaux Graham (bass), Bob Landgraff (harmonica and vocals), Colin Guerra (guitar) and Dr. D (guitar and keyboards). Happy Horse Band has its roots deep in the smokey coals of the campfire scene at Happy Horse Hotel, where horse folk meet up in Central Texas to share their passions for horses, trail riding and the outdoor lifestyle Hollis got hooked by in early childhood. Hollis Wayne (lead vocals, harmonica), DB Rouse (lead vocals, guitar), John Warner Dunn (bass, backup vocals) and Pete "the Beat" Langhans (drums, backup vocals). With Rockin' & Ridin', HHB has created a lush sonic oasis that pushes the envelope of Americana and folk into the driving rush of rock 'n roll. We know it's gonna make you HAPPY!